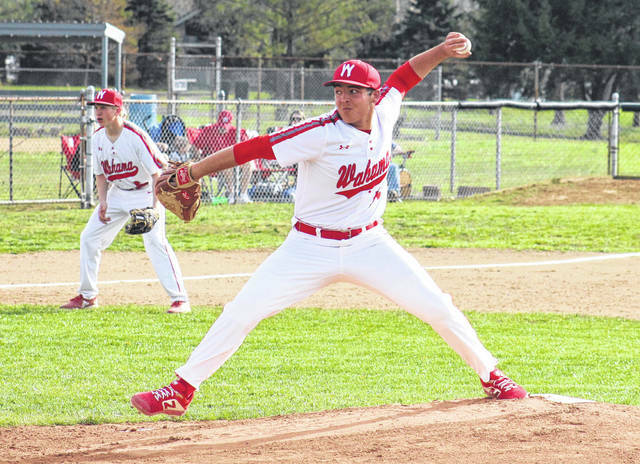 Wahama senior Antonio Serevicz delivers a pitch, during the White Falcons’ 8-1 victory on Thursday in Mason, W.Va.
MASON, W.Va. — There truly is no place like home. 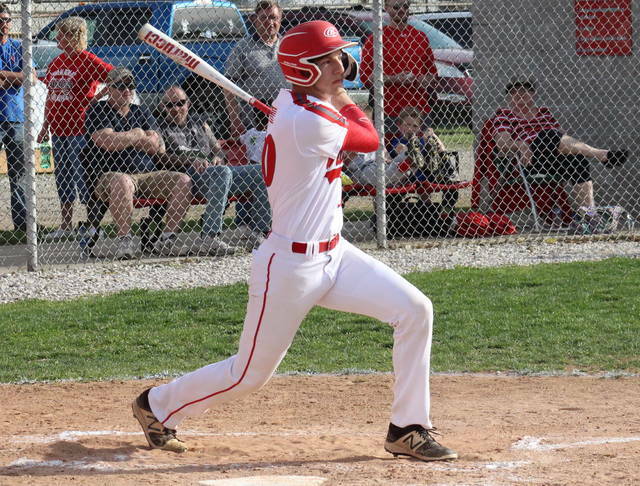 The Wahama baseball team remains unbeaten at Claflin Stadium this season, as the White Falcons soared to an 8-1 victory over Tri-Valley Conference Hocking Division guest Waterford on Thursday. 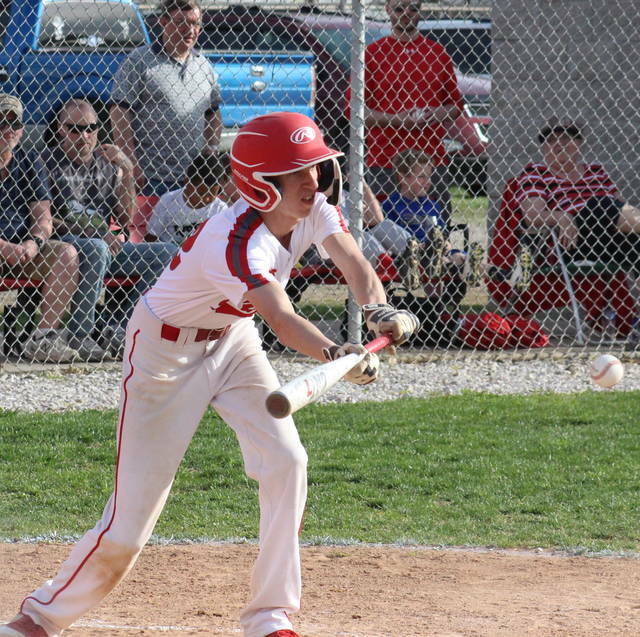 Wahama (12-3, 7-2) — 8-0 on its home field, where the Red and White have outscored opponents by an combined 93-to-22 margin — broke the scoreless tie on Thursday in the bottom of the second inning, as Tanner Smith scored on a wild pitch. The hosts took advantage of another wild pitch in the third inning, as David Hendrick scored to make the margin 2-0. Waterford got one run back in the top of the fourth, as Zane Heiss led off the frame with a home run. The Wildcats were held to just one hit over the remainder of the game, however, as Wahama retired 12 of the final 13 batters. The White Falcons gained some breathing room in the bottom of the fifth inning, with two runs scoring on a two-out Antonio Serevicz single. Wahama capped off the 8-1 win with a four-run sixth, with Cooper Peters hitting a three-run triple and then scoring on a sacrifice from Hendrick. Serevicz was the winning pitcher of record in five innings for the hosts, striking out eight batters and walking one, while allowing one earned run and two hits. Tanner Smith finished the game on the mound for Wahama, striking out two batters, and surrendering one hit. Braden Bellville took the pitching loss in a complete game for Waterford, striking out nine and walking three, while giving up eight runs, five earned, on eight hits. Leading Wahama at the plate, Hendrick was 2-for-3 with a triple, a run scored and a run batted in, while Ethyn Barnitz was 2-for-3 with two doubles and one run. Peters tripled once, scored twice and drove in three runs for the victors, Serevicz singled once and drove in two runs, while Brayden Davenport singled once and scored once.Tyler Bumgarner contributed a single to the winning cause, while Smith, Jacob Fisher and Jonathan Frye added a run apiece. To go with Heiss’ home run, Jacob Huffman and Joseph Zimmer each singled once for the guests. 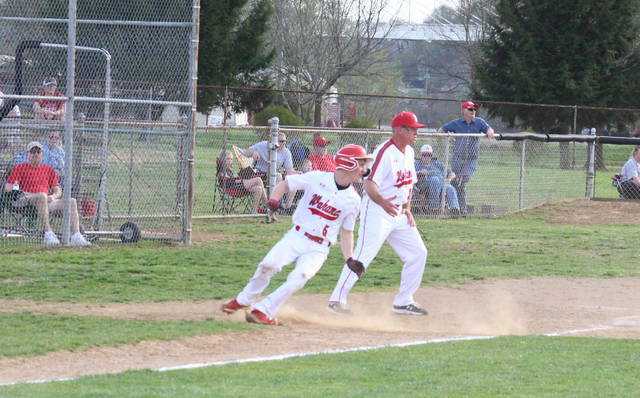 Wahama committed one error and stranded five runners, while Waterford had two errors and three runners left on base. This gives Wahama a season sweep of the Wildcats, as the White Falcons claimed an 8-3 decision in Washington County on March 26. After a trip to Southern on Friday, Wahama will be back at Claflin Stadium on Saturday afternoon against Ravenswood. https://www.mydailyregister.com/wp-content/uploads/sites/24/2019/04/web1_4.13-WAH-Serevicz.jpgWahama senior Antonio Serevicz delivers a pitch, during the White Falcons’ 8-1 victory on Thursday in Mason, W.Va.